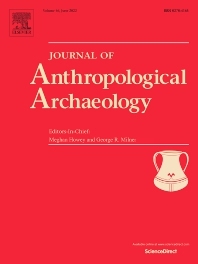 An innovative, international publication, the Journal of Anthropological Archaeology is devoted to the development of theory and, in a broad sense, methodology for the systematic and rigorous understanding of the organization, operation, and evolution of human societies. The discipline served by the journal is characterized by its goals and approach, not by geographical or temporal bounds. The data utilized or treated range from the earliest archaeological evidence for the emergence of human culture to historically documented societies and the contemporary observations of the ethnographer, ethnoarchaeologist, sociologist, or geographer. These subjects appear in the journal as examples of cultural organization, operation, and evolution, not as specific historical phenomena. The concomitant range of socioeconomic complexity encompasses the simplest human culture, or "proto-culture," as well as the most complex states or empires.